Are you interested in reading a gripping, powerfully honest and spiritually moving account of life with all its ups and downs, joys and sorrows, heartbreak and hope. 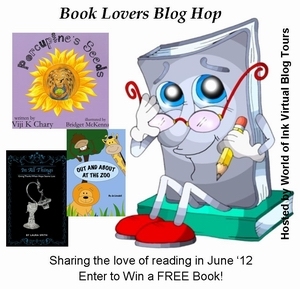 Step into the life of one such author, join me in welcoming my quest……. While some write to entertain, I found the writing process was very healing for me. Journaling through trials helped me to empty the pain of the day from my heart onto paper so I could start fresh the next day. This was the case when I initially started writing “In All Things”, it was simply in a journal and was a way for me to try and process the grief of going through miscarriage. My original intent was never to publish a book however; when I had one person read it and then another, and another, the feedback was amazing! It was like a sense of urgency that the message within was something people needed to hear. And even the men who have read it have been profoundly affected. I write very honestly and hold nothing back. I believe that by the power of our testimony others can find healing. I also believe sugar coating things makes for a nice story but has no impact. The first editor I contacted to go through my book wanted me to remove a lot of life events because it wasn’t “Christian” like. Well, I’m sorry but I’m a real person and experience real life issues and others need to hear the real stuff. When I was very young, I remember sitting in my grandmother’s kitchen on the floor while my grandparents and their friends sat at the table playing cards. They would play for hours and hours and often times into the night. While I would sit there on the floor, I was very content in doing so because I was in my own little world doing what I never imagined would be my heart’s desire later in life. I was writing stories and songs and reading them or singing them out loud for my card playing family to adore. Now, thinking back to that time and the fact that I was only about 4 years old and had no idea how to even write my name let alone a story or a song, I’ve concluded that it had to be God planting within me the inspiration and desire to write. Fast forward to my teen years I remember wondering why I was even on this earth, or why would God put me in a family that didn’t seem to even want me. I was always called a mistake and they would tease me when I was younger that they found me on the streets of St. Paul. It’s no wonder that I married the town rebel two weeks after my high school graduation! Finally someone loved me and I wasn’t going to let that go. Again, fast forward 18 years and two daughters later, I’m re-married. My youngest daughter was molested by her biological dad, is diagnosed with PTSD (post-traumatic stress disorder) and Bipolar disorder, my oldest daughter diagnosed with neurofibromatosis and going through numerous back surgeries, many other trials and then being told that my husband and I will never have a child of our own. But wait! After weeks of being sick a random pregnancy test to rule out that possibility, I’m PREGNANT! A miracle! It took us weeks to absorb this miracle and with growing excitement from our entire family, I lost the baby 3 months into the pregnancy. Since the publishing of this book, I have had inspiration for another book to be a second in the “In All Things” series. The next one will be “In all things; Expect A Miracle” which will be an account of the amazing two years going through my dad’s cancer journey with him. Also since publishing, I have been asked to speak at a few local events and my desire is to be able to do that more. I feel that when you can share your story in person, it can touch people more profoundly. At one of the events where I shared my story, there was a lady in the audience that was healed instantly from the pain of miscarriage she was suffering from for two years! I would love the opportunity to see others find that same healing and freedom to live again. I encourage others with a personal story to get it out there, the reward and I don’t mean monetary is far greater than the fear. 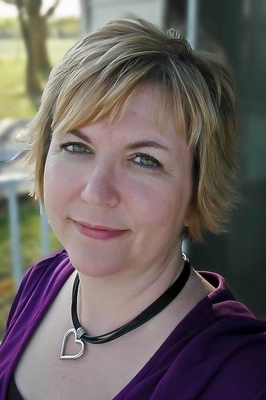 Author Bio: Laura works as a medical coding and reimbursement specialist in Northern Minnesota. In All Things is a witty and raw account of an otherwise normal life filled with incredible challenges that will make you laugh out loud and cry tears of joy and tears of sorrow. Her little family had no idea that the life experiences they walked through early on and one life altering event would prepare them for the near death of her oldest daughter. 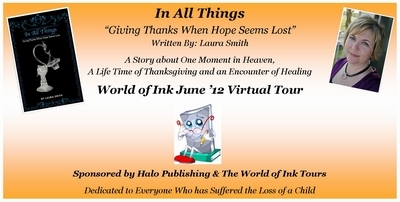 Link to Purchase: http://www.halopublishing.com/bookstore/Laura-Smith also available at all major online book sellers. This entry was posted in Interviews and tagged Laura Smith, Virginia Grenier. Bookmark the permalink. Very inspiring discussion Laura. I spent most of my life journaling and I was surprised to learn how much we share in common. Your book sounds like a beautiful testimony of life, with all of its joy and challenges that test you to the core. I’m glad you turned your journal into a book, what a lovely legacy for your children. Enjoyed your video. Love the title of your next book. Great Post, Diane. Thank you so much Patricia! I do hope it is a legacy for generations to come. Thankyou Pat for your lovely comment. Thank you, Laura. I too have found journaling to be an important part of my life. I believe whether writing memoir or fiction (realistic or otherwise) we need to get real with the true range of life’s experiences and emotions! I am sure your book will bring healing to many. Diane, Stacy is going to love this post! Thank you Diane. I sure hope it does bring healing to many. Thankyou Joanna, sure hope Stacy pops by. Wonderful tribute to the power writing has not only to heal ourselves, but also others. Thankyou Julie for your comment. What an amazing story! You must be a remarkable woman. I love your writing style too. Hooked already. Thank you so much Catherine, What an encouragement your words have been to me! Thankyou to from me Catherine. Excellent post. How wonderful that you were able to use journaling and writing as a way to help you, and now others, through such very difficult times. Thank you Susanna! I can’t tell you how appreciative I am for everyone’s kind words and positive feedback! Thankyou Susanna. I think Laura, you will find many who comment here are very encouraging and delight in giving postive feedback. Wow Laura! My impression of Mid-Westerners has been knocked out! I have found astonishing friendliness and amazing generosity yet little intimacy, and yet you have in one interview floored me with your self, within the facts and between the lines! Thank you both for a wonderful interview and an invitation to read what must be a profound narrative. Can’t wait! Thankyou Julie for your lovely comment, I am sure you will not be disappointed.